Current IT Operations monitoring tools run as siloed solutions to support specific teams within IT Operations. This limits IT Operation's ability to detect, diagnose and address performance issues. Gain deep insights from collected data by embracing AIOps techniques that will pervade all aspects of monitoring. How to help IT Operations & DevOps deliver efficient and high quality services. 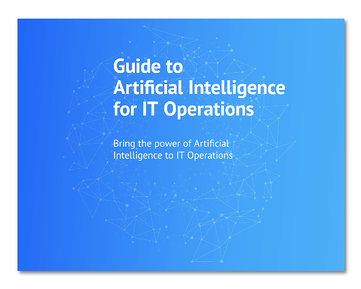 Take the first step toward AIOps by downloading this guide now. We are happy to share this information with you. From time to time, you'll also receive updates on related topics and happenings.